Mr Kavas will be on hand at the Cannes Yachting Festival to talk about using our new Bali 5.4 catamaran on a Greek yacht charter in 2019. Come talk to the owner of our company to see what we have to offer, from our comfortable monohulls to our luxury catamarans. With top rated customer service and a family feel to the business, you can be assured of a wonderful week or two cruising the Aegean and Ionian seas on some of the best vessels that Greece has today. Go island hopping through the Cyclades or Ionian islands and be as sociable (or otherwise!) as you like on our well maintained vessels, in the knowledge that you will be well looked after on the rare event that you need to deal with us while on your adventure. Experience the different subcultures of the islands and archipelagos as you explore the best Greece has to offer on your trip. Uncomfortable with sailing yourself? Use a hired skipper and / or crew to both take you to some of the best kept secrets and to perhaps learn the ancient art of seafaring as you go. We will be at stand MULTI100 at the Cannes Yachting Festival. The Bali 5.4 is the very best vessel we at Kavas Yachting has to offer, and will be at stand MULTI100 at the Cannes Yachting Festival. 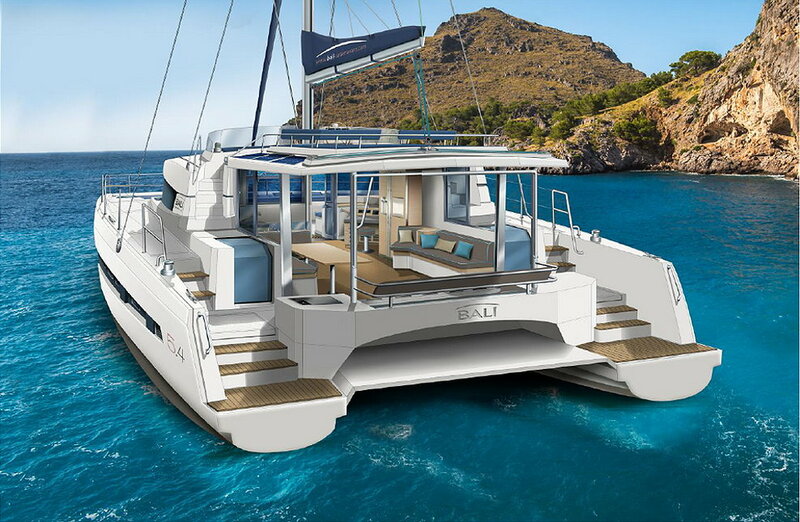 This 16.8 metre luxury catamaran sails like a dream yet is built with comfort first and foremost in mind. Hide from the heat of the midday sun in her air-conditioned cabin - or just under the cockpit bimini as you sail to your destination. For the hours you want to bronze your features, there is ample sunbathing pace, and when you want to take a dip in the sea (perhaps at a deserted island cove), use the stern swimming platforms to dive in and enjoy the azure depths of our beautiful Greek waters. You don’t have to worry about continually filling your water tanks as you travel either due to the water maker that we will have aboard. Other comforts include her double cabins with en suite heads and a large and comfortable saloon that is great for the odd evening in with new friends. The Cannes Yacht Festival is Europe's biggest boat show, with some 600 boats being shown by 528 exhibitors in this beautiful location in Southern France. Join the throng of a predicted 50,000 visitors, more than half from outside France, who will come to explore the best that Europe’s yachting scene has to offer. You never go to France without having a good lunch! Have ‘un bon dejeuner’ and perhaps ‘un verre de vin’ (or two!) as you explore the different yachts and yachting services that the biggest and best yachting festival in Europe has to offer. Mr Kavas looks forward to seeing some of our regular customers and perhaps a few new ones.